Urethane Truck Bushings – Abrasion Resistant! Urethane Truck Bushings are manufactured at Plan Tech to meet the quantitative and qualitative demands of our numerous esteemed customers using high-quality raw materials from universally renowned chemical manufacturers. To ensure we consistently meet the high volume demands of our customers without compromising quality, our manufacturing team always apply speed and precision. That explains why our urethane truck bushings have been tested and proven to offer outstanding physical properties which include remarkable resistance ability against wear, abrasion, corrosion, and chemicals. Our proprietary polyurethane formula allows our truck bushings to be one of the most durable available. They are designed to exhibit very good mechanical properties, and as such, they have very high resistance to weathering, as well as gas or oil. Our in-house capabilities also help in reducing production cycle time from receipt of order to the final delivery, and we use advanced technologies in our machine shop to ensure that your polyurethane truck bushings meet all critical dimensions. So, tell us! For what application or applications do you seek custom urethane truck bushings for? Do you have a particular design, sketch or sample in mind? Or are you just looking for a reliable company you can entrust with urethane truck bushings demands? Well, whatever the case may be I am glad to inform you that Plan Tech has got you covered. For over 30 years we have focused on using speed and precision to manufacture the highest quality industrial cast urethane parts to our customers. A particular strength is the breadth of our in-house capabilities such as urethane compression molding and grinding urethane parts which, when combined with our extensive experience, enables us to deliver tight tolerance custom urethane parts while maintaining the quality control and cost effectiveness our customers require. The tests are performed according to an established set of standards provided by an accredited testing organization such as the Society for Testing and Materials (ASTM) who define the procedures in detail. 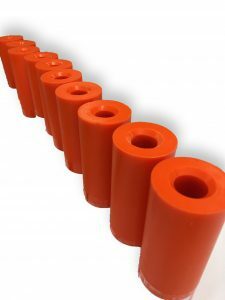 Are you interested in cast Urethane Truck Bushings? Please Contact us so we can help solve your requirements and work with you on your specific application!